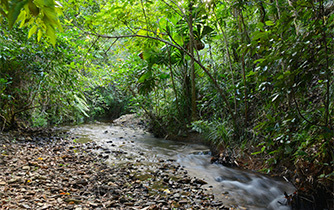 Cow Bay Homestay offers bed and breakfast accommodation in the World Heritage Daintree Rainforest, two hours' drive north of Cairns, in Tropical North Queensland, Australia. We are located half way between the Daintree River and Cape Tribulation in Cow Bay, off the main tourist route, and only 1.5 km from Cow Bay Beach. Our location provides easy access to all tours and attractions in the Cape Tribulation area, the Daintree National Park, the Great Barrier Reef and Cooktown. 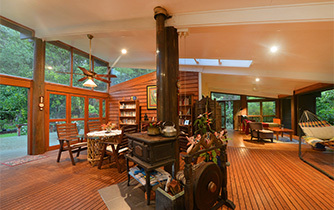 Our timber pole home is designed for the tropical climate. The rooms and deck provide views to the Alexandra Range and the hills of Daintree National Park. There is no mains power in this area north of the Daintree River and we use solar power, batteries and a generator back up. We have fans in the bedrooms and veranda and during the wet season environmentally sound air conditioners. Some walls are bi folded louvers which when open provide an unrestricted view into the tropical garden. Cow Bay Beach is 15 minutes' walk away from your bed and breakfast accommodation, with its three palm fringed bays and beautiful inshore reefs. Cow Bay Beach is one of the most beautiful and remote beaches in the Daintree area .2 fresh water creeks run into the sea here and provide a unique ecosystem. There is always a spot in the shade of the trees and plenty of room to walk or explore or fish or just relax. We have lived here since 1996 and are happy to assist you planning your holiday here. There are numerous self-guided activities. Excellent local tours can be booked in advance or while you are here. Click on Make a Booking to check availability and access the secure, live and fast online booking service. Includes breakfast Double and Double/Twin. Minimum 2 nights stay. Bookings essential.
" Thank so much for a delightful, peaceful and restful stay in your beautiful place !" " Wir haben 3 schoene Tage gehabt, weit weg von Strassenlaerm und Massen Touristen. Vielen Dank fuer das leckere Fruehstueck, Tips fuers Essenund Buchung fuer Ausfluege. Wir bereuen nur, dass wir nicht laenger gebucht haben." 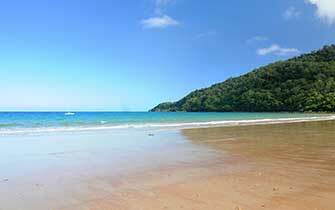 "We had lovely 2 days in the Paradise on earth:called Cow Bay Homestay. We ejoyed the night walk at Corocdylus and the crocodile cruise on Cooper Creek.Just sitting and reading a book was also like living in the Paradise. Thank you for these beautiful two days in the very nice and good room." "Being back in one of Germany's cities and living in an appartment building again it helps a lot to know that somewhere in the universe there is an awesome place like Marion's Cow Bay Homestay. While you enjoy the little comforts of civilization like your private room with bath and shower you also will be part of the diversity of the rainforest as soon as you leave the house and walk for a minute. A feast for your senses: different sounds, smells and colours will conquer you and if you are tired of looking at walls of green just walk 15 Minutes down to the beach and enjoy the magnificent coastline of the Cape Tribulation area." "This is a place on earth that you just cannot imagine from Europe. A real paradise. I haven't completely recovered...In the middle of the rainforest, the homestay is an amazing house, 10 min walk from the beautiful beach where you can spend the afternoon without spotting more than a few tourists in the distance. Marion and Brian are very friendly and welcoming hosts, and they're happy to talk about the region, its history and its nature over a nice bottle of red wine!"